Economic Utopias and Dystopias is a literary event and community conversation about America’s current economic system and how literary visions of future economies could transform society. As America becomes more stratified along class lines, is it enough to increase social programs and charitable giving? Or, does the society’s economic system need a complete transformation? 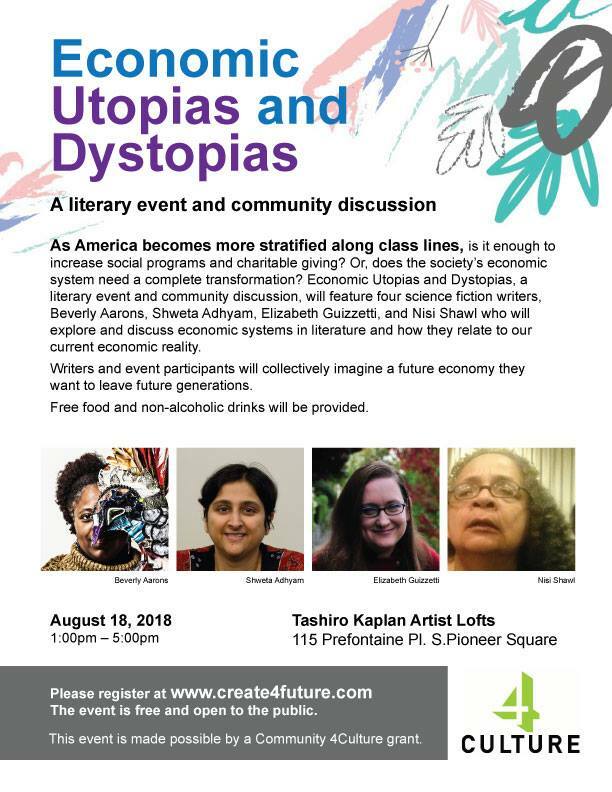 Economic Utopias and Dystopias, a literary event and community discussion, will feature four science fiction writers, Beverly Aarons, Shweta Adhyam, Elizabeth Guizzetti, and Nisi Shawl who will explore and discuss economic systems in literature and how they relate to our current economic reality. Where: Tashiro Kaplan Artist Lofts – 115 Prefontaine Pl. S.
This entry was posted on August 7, 2018 by Seattle Black Feminists in Uncategorized and tagged Pioneer Square.